BARACK OBAMA IN THE WHITEHOUSE: Obama in his first Rally stating "We can't turn back now"
Obama in his first Rally stating "We can't turn back now"
As expected, President Obama did not let the crowd down. 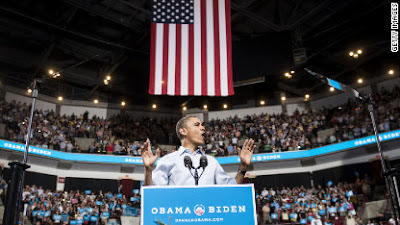 In the very first campaign rally of the year in Ohio, President Obama gave a speech to a large audience at the Ohio State University Schottenstein Center. With the slogan "FORWARD" President Obama outlined his campaign. During his speech he mentioned Mitt Romney as his opponent in the election. He outlined the reasons why he should be elected and the other guy should not. He said that America can't afford to adopt Republicans' "bad ideas." His speech was only 36 minutes long, but in that time, he outlined his campaign. Obama stated one of his reasons for running was that if Mitt Romney was elected, that Romney would "rubber stamp" the GOP Congressional agenda. The President reminded his audience how many jobs were lost during the Republican Presidency of George Bush. In numbers hard to imagine, President Obama stated that the country lost 3,000,000 jobs in the last 6 months of 2008. Accomplishments that he is responsible for were highlighted in his speech, for example how the Federal Government rescued the big auto companies like GM who is now posting record profits with booming car sales. In comparison, his rival Mitt Romney who was born in Michigan opposed the bailout, saying that a structured bankruptcy was the way to go, just so the government would not have to pay. Romney also didn't like the concessions to the automotive union when the bailout was created. In other accomplishments stated during the speech, President Obama listed foreign policy achievements, including ending the war in Iraq during his first term in office. He made that prediction when he was still Senator of Illinois. He mentioned that Osama bin Laden is no longer on the face of this earth, no longer a threat to the country, along with al Qaeda now on the run and heading towards defeat. Another pledge made just a few days ago while making a surprise trip to Afghanistan, that he would pull out all of the U.S. troops by 2014, and that war will also truly be over. He also wanted everyone to know that Romney had opposed the pullout of American troops in Afghanistan. He talked about not denying citizenship to responsible young people just because they were the children of illegal immigrants. This was another area that Romney was thinking the opposite than President Obama, because Romney did not support the push for a limited pathway to citizenship for some illegal immigrants. Over 14,000 people attended the rally, but in comparison to any rally so far for Mitt Romney, there was no comparison because Romney never had a crowd during any speech of his since he began running for the office of the United States. The President claims that the families are still struggling to pay their bills, find jobs and keep their homes. Still Romney blames President Obama for all of this and anything negative he can think of. President Obama mentioned to the crowd that his opponent Mitt Romney will continue to run a negative campaign. On November 6th, the Presidential elections will be held, and the best man will be left standing. At this point it's hands down in Obama's favor.